Thank you letters, graciously and sincerely written, are essential in the business world. Whether a former boss has provided you a reference, a business contact has recommended you to their employer, a colleague has helped you with a project, or a potential new boss has just interviewed you for a position, it is important to take the time to thank everyone who helps with your career or job search. Thank you letters are a great way to express your appreciation for people’s help. However, they can also help you in a number of ways. A thank you letter can help you maintain contact with someone in your network. It can help you remind a hiring manager why you are a good fit for a position. It can also show your supervisor that you are professional and polite. Make sure you know both what to say in your letter, and also whether to send your note as an email, letter, or card. Saying the right thing using the right format will impress your recipient, and make him or her feel appreciated. How you send your thank you letter depends on many factors. Email is pretty much the standard for business communication these days. If a prompt follow-up is essential – for example, if you want to express gratitude for the opportunity of a job interview before the hiring committee makes its decision – email is the way to go. Print thank you letters can take the form of an informal, handwritten note or a formal, typed letter. How you write the letter should show your understanding of the company and person you are thanking. If you know you have time to relay your thanks by mail, a written thank you shows that you've taken an extra step to show your appreciation. More traditional companies often prefer either a typed letter or a handwritten note. However, if you want to really personalize your message of thanks (for example, if you are thanking a coworker whom you’ve worked with for years), consider a handwritten card. No matter what form you use to send your thank you note, there are certain components you should always include. Address the person appropriately. At the start of the letter, address the person with a proper salutation, such as “Dear Mr. Lastname.” or “Dear Firstname.” If you know the person well, use the person’s first name. Otherwise, address him or her as Mr., Ms., or another appropriate title. Say thank you. Get to the point of your note quickly. Say the words “thank you” in the first sentence or two, so the person knows why you are writing. If you are sending an email, include the phrase “Thank You” in the subject line as well. Give (some) specifics. Make sure you specify what you are saying thank you for. Go into a bit of detail, so the person understands exactly what you appreciate. For example, if you are saying thank you to someone who gave you job advice, explain exactly what you found to be most helpful. If you are saying thank you after a job interview, remind the person of a particular moment from the interview (or remind him or her why you are a good fit for the job). A bit of detail shows the person what you really appreciate, and why. Say thank you again. Before signing off, reiterate your appreciation. Sign off. 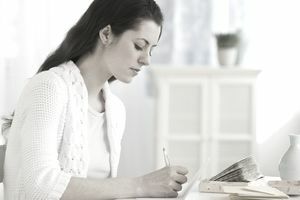 Use an appropriate closing, such as “Best,” or “Sincerely.” Then end with your signature (handwritten and typed if it is a letter, handwritten if it is a card, and typed if it is an email). Send it as soon as possible. Write and send your note as soon as possible. Don’t delay in sending your thanks, especially after a job interview. Not sending a thank you letter after an interview can hurt your chances of getting hired. Be positive but sincere. Express your gratitude, but don’t go overboard. People can tell when a thank you note is insincere. For example, if you are thanking an employer after resigning from a job, you should express your thanks, and focus on what you liked about working there. However, don’t lie and say you loved everything if you didn’t really. Focus on the positives, but don’t lie. Personalize each letter. Personalize each thank you letter you send. For example, if you send thank you notes to everyone you interviewed with for a job, add something to each note about your specific conversation with each person. Don’t simply copy and paste the same message for each person – this will come across as insincere. Keep it brief. Thank you notes should be short. Keep your note no longer than a couple of concise paragraphs. Edit, edit, edit. A thank you note in the workplace must be professional. This means it should be well written and error free. Proofread your letter carefully before sending it. This is an example of a general thank you letter. Download the general thank you letter template (compatible with Google Docs and Word Online) or see below for more examples. I hope you are well. I just wanted to say thank you so much for writing me a letter of reference for the job at Acme Retail. I really appreciate you taking the time to write the letter. I am happy to announce that I have a second interview with the company next week! I will let you know how it goes. Again, thank you so much. I greatly appreciate your assistance with my job search. When sending an email letter, as opposed to a traditional mailed one, there is no need to include your return address or your address at the beginning of the message. Simply list your contact information in your signature. I would like to thank you for the invaluable support you provided to me during my recent career search. When I began this search, I had very little idea how to go about it – or especially, how to network to discover new job opportunities. The information and advice you gave (and, in particular, the list of contacts you shared with me) made all the difference in helping me to focus my job search. I’m happy to report that I have just accepted a new position with ACME Auto! Again, thank you so very much. I greatly appreciate your generosity.